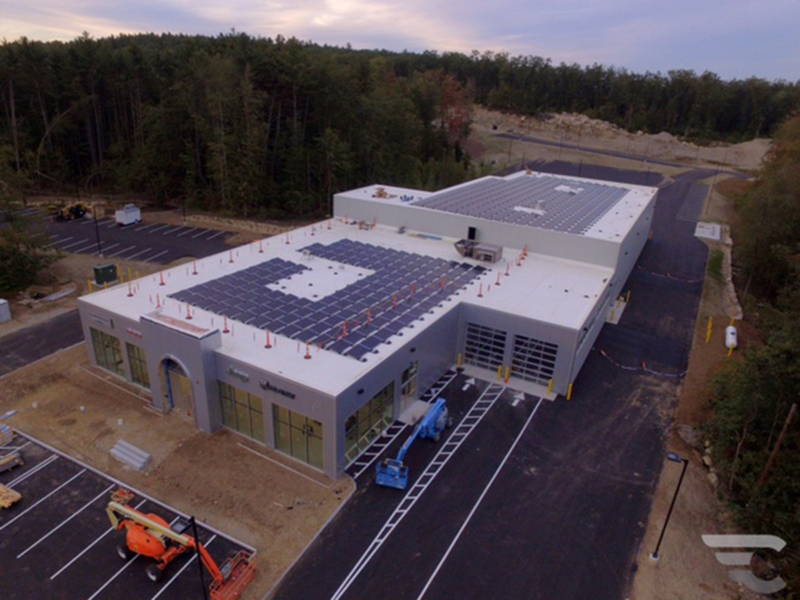 Milford, NH New Hampshire’s largest solar-powered auto dealership plans to open its new facility this fall at the northeast intersection of Rtes. 101 and 13. Contemporary Automotive’s 25,000 s/f dealership on Hammond Rd. incorporates several environmentally-friendly design features, notably a 135-kilowatt solar array installed by New England-based ReVision Energy. Electricity generated by sunshine offsets the majority of the dealership’s electric load and serves as a powerful tool to lock in energy costs, saving the dealership upwards of $400,000 over the life of the system. Energy efficient design elements also include indoor and outdoor LED lighting and a tight building envelope. Outside the dealership, stormwater runoff is managed by four, large bioretention gardens, minimizing the impact of impervious surfaces. Landscaping with plants, trees and grasses native to New Hampshire were intentionally chosen as they require less watering. Inside the facility, large, destratification ceiling fans in the showroom, a service drive-thru and repair shop circulate air flow more efficiently and optimize the building’s HVAC system. The Chrysler Dodge Jeep Ram FIAT service center collects and repurposes used motor oil. Two Reznor waste oil boilers, each with a capacity of 500,000 BTUH, generate approximately 70% of the building’s heating needs, distributed with comfortable, radiant floor heating. The eco-friendly facility encompasses a six-vehicle showroom, two-lane enclosed service drive-thru, 16-bay shop, on-site parking for up to 450 vehicles and electric vehicle charging stations. Additional customer conveniences include a spacious customer lounge, commuter workstations, complimentary Wi-Fi, quiet room, children’s play area and MOPAR parts and accessories boutique. The new facility replaces the company’s prior location on Elm St. The solar array generates 149,700 kilowatt hours of clean energy each year. The solar power produced by the array is equivalent to offsetting 157,634 pounds of carbon pollution per year, which is equivalent to the emissions of 8,046 gallons of gas or 175,249 miles driven by the average passenger vehicle. The array includes 450 Q Cells solar panels, each rated at 300 watts. The panels are ballast mounted across two, white rubber roofs which reflect sunlight more effectively than black rubber. The system also includes three SolarEdge inverters, which convert direct current generated by the array into alternating current used by the facility. A live, web-based monitoring platform allows the dealership to track the array’s performance. The dealership was designed in conjunction with Sandford Surveying & Engineering of Bedford and Warrenstreet Architects of Concord. Site work and construction were managed by Turnstone Corp. of Milford.